On Sunday, June 3, 2018, Saint Brigid Catholic Parish conducted a Eucharistic Procession in honor of the feast of the Most Holy Body and Blood of Christ (Corpus Christi) . Rev. Andrew Booms, pastor with permission from Most Rev. 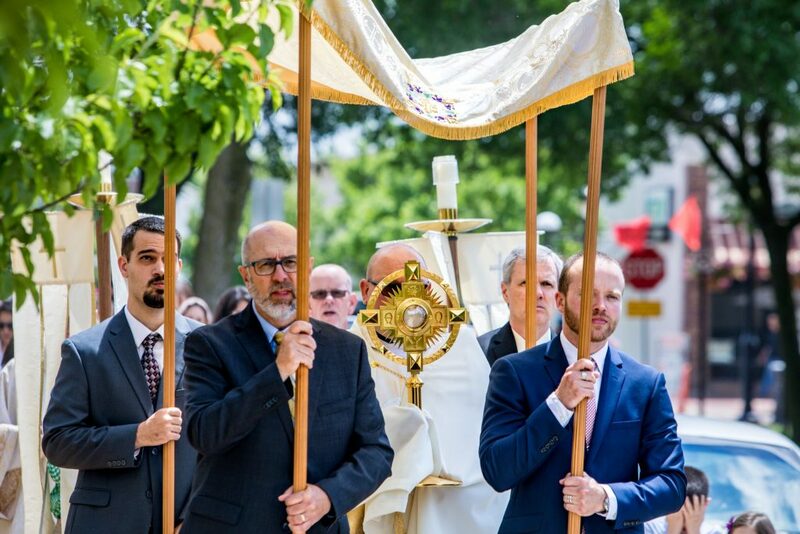 Bishop Joseph Cistone, led the community as it processed around the church campus with the Eucharist exposed in a monstrance. These once common processions are like a royal parade, with the crowds coming to greet the Lord. The members at Saint Brigid who participated and planned the procession want to help the community recognize Jesus in our midst and be disciples at all times. Eucharistic processions are a visible reminder that we must live our faith as a blessing when outside the walls of the church. For this reason the procession pauses four times to offer benediction (a blessing from the holy Eucharist) to all four corners of the world. 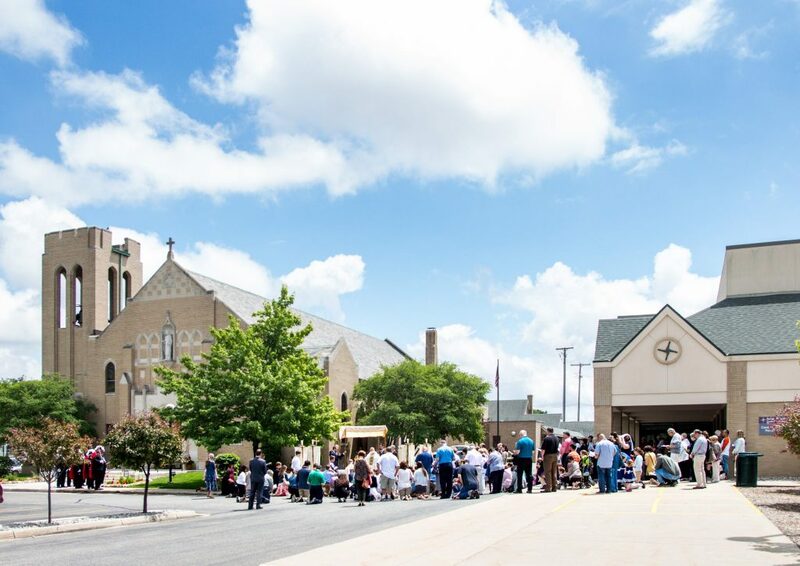 Upon returning from the procession to the Church, the community prayed for all families and youth in our Diocese, that they might be blessed and guided by Jesus at all times. Plans to follow up with a second procession on June 23, 2019 have begun. The feast of Corpus Christi is commemorated each year 2 weeks after Pentecost. This Eucharistic day, observed with such solemnity throughout the world, began in a quiet Belgian convent in the thirteenth century, with the vision of a holy nun, St. Juliana. In her vision, she saw the moon, full and bright. It was glorious, except that one part of its disk was in shadow. The meaning of the vision was then revealed to her: the moon represented the liturgical year; the shadow, a missing feast in honor of the Blessed Sacrament. Juliana spoke to her confessor about what she had seen. Amazingly, within thirty-five years, Pope Urban IV had established the Feast of Corpus Christi, the Body of Christ, in the Church’s universal calendar. Hundreds of years later, in 1849, Pope Pius IX added the Feast of the Precious Blood, celebrated on July 1. Following the Second Vatican Council, the two liturgies became one solemnity in honor of the Most Holy Body and Blood of Christ. 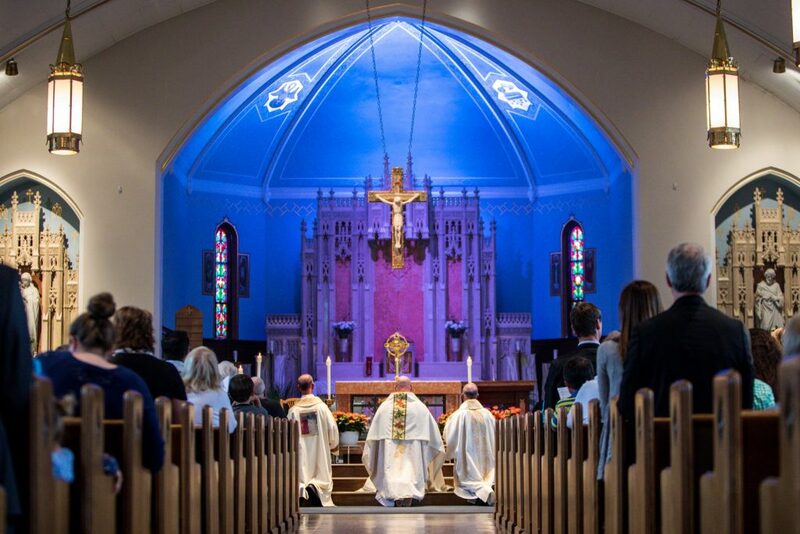 Of course, we already had a day honoring the Eucharist: the Evening Mass of the Lord’s Supper on Holy Thursday, which even includes a procession with the Blessed Sacrament. But the purpose and the mood of the two processions are strikingly different; Holy Thursday being the somber entrance into commemorating the Passion of the Lord and Corpus Christi celebratory of the Lord’s eternal presence to the Church.